Choosing AQUARIUM PLANTS - Fake Or Real For Your Freshwater Aquarium? When setting up your new aquarium, you will soon realize that it looks bare without decorations or plants. These additions, besides serving a decorative function, are a necessary addition for the health of your fish. Plants make your fish more comfortable in their home by providing hiding spots. When it comes to aquarium plants, there are two main choices: real or fake. Live would require care, just like houseplants. They will need to be chosen wish your fish species in mind and will require more of your time than fake plants, which require little effort and are easy to care for even if you're not an experienced fishkeeper. While fresh may die if the water quality is not monitored closely, fake plants can withstand everything. The only care required is an occasional cleaning in the sink. Plastic plants are also available in a wide array of styles and colors, including neon shades, that simply isn't achievable if you choose to plant your aquarium with real aquatic plants. However, neon plants do not create a very natural setting and may stress out your fish. Many have found that plastic, even those with natural colors, simply do not have the realistic appearance they are after. If you're looking for aquarium plants that are realistic, yet easy to care for, consider silk. These are just as easy to care for as plastic plants but lend a more natural appearance to the tank. Always purchase silk plants designed for aquariums, because they will not contain any chemicals that could leach into the water and harm your fish. There are advantages to using real plants in an aquarium. If you are interested in breeding fish, you should know that some fish species will only breed in an environment with live plants. Fresh plants also add oxygen to the water and use nitrates, becoming a beneficial part of the nitrogen cycle and helping to clean your tank. Live plants are eaten by many species of fish, and in fact are one of the healthiest and most natural food sources you can provide for the herbivores in your tank. Despite the benefits of using real plants, they can require specialized care. If you do choose to plant your aquarium with fresh plants, be sure that you understand their care requirements. Plants also require specialized aquatic fertilizers and lighting; no plant can grow without lights, which are required for photosynthesis. Many varieties of aquatic plants require specific pH levels or water temperatures. If these are incompatible with the needs of your fish, one or the other will suffer. You'll need to choose plant varieties that are compatible with the fish in your aquarium. Cleaning a planted tank is more difficult than cleaning one with fake plants because real plants should not be uprooted for cleaning. As the plants naturally decay, there will be more waste material at the bottom of the tank, which can reduce water quality over time. While healthy plants will improve the aquarium habitat, those that are not cared for properly have the potential to harm your fish. Aquatic plants require pruning, just like your houseplants. Only you decide whether planting your tank with real ones is worth the additional maintenance. If it is your first time ever having fish, choose fake ones. The complicated care of real ones can get quickly become overwhelming if you're not used to caring for an aquatic habitat. There is always a certain amount of joy and fun in putting decorations in your freshwater aquarium. In fact, adding artificial plants to your aquarium can cost a little less than the money you spend on maintaining your aquarium. 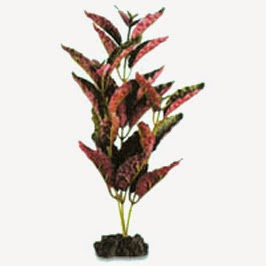 As we all know, artificial plants are reasonably priced and they require very little care and maintenance once they are placed in the aquarium. The idea of placing them in your freshwater aquarium was introduced rather late. There was a time when artificial plants were looked upon as eyesores by many 'newbies' in the aquarium community. Today, however, their appearance is very similar to real plants and you have to actually touch them to tell that they are made of plastic materials. In fact, the majority, if not all artificial plants used in freshwater aquariums, are made from silk allowing them to freely move in the water. One of the greatest benefits of using artificial plants in aquariums is the fact that they shine in all their glory the moment you place them in your aquarium. This has a glorious effect that live plants can never provide since they need time to grow and blossom. As a rule, however, it is necessary that before you add artificial plants to your aquarium you must ensure that they are thoroughly cleaned and that they are free from any contaminants that can harm the fish. A little trick to make your the plants appear more realistic: soak them in warm water for thirty minutes. This is good for softening the fabric. What's more, artificial plants do not require additional care and maintenance. They can stay as they are whether or not the aquarium is lighted. There are no problems when adding special nutrients and you can basically place them on any aquarium substrate. In fact, you can execute the most daring design when it comes to arranging them in the aquarium. By choosing your favorite artificial plants, you can easily place them anywhere you wish. If the time comes when you decide to remove them, you can easily do so without the worry of hurting the fish or damaging the tank. In fact, you cannot kill your artificial freshwater aquarium plants, and so you do not have to worry about pruning or feeding them to them to make them grow. They will always be what they are-artificial plants. But if well chosen, they are not ordinary plants and though they are lifeless, they bring about the appearance of life to both the fish and spectators. Moneywise, they are way cheaper than live plants because you only need to purchase them once, and you can continue to enjoy their beauty for as long as you desire. They only cease giving life to your freshwater aquarium once you decide to throw them away. Finally, artificial plants can significantly add life and beauty to your freshwater aquarium without causing any danger to the fish. Aside from the fact that they are very easy to care for, you do not need to monitor them very closely as they will never invite algae to grow on them. Maintenance is also inexpensive and cost-effective.